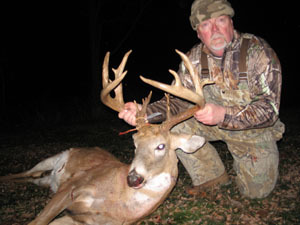 " Biggest Deer of My Life"
“Biggest Deer of my Life” says Jim Yonge. It was the last day of gun season for me and I just wanted a day in the woods. 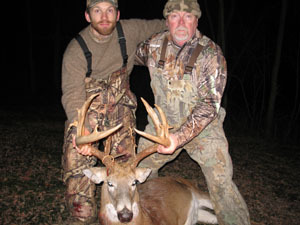 I‘ve been hunting for 50 years and have seen a lot of good size deer; but this one is a “Stud on Steroids”. He weighs in at 220lbs, and a solid count of 17-points with nine more less than 1 inch. I had always counted the points as a point if you could hang a ring on it, NYS requires each point to be 1 inch to be a legal point. None the less I could not be happier. I also have to say thanks to my Uncle John who taught me so much about hunting; I could hear his words, “Don’t look at the antlers... just take a breath and focus on the shot.” On the third breath I took the shot. My friend Justin Baker AKA "Highvelocity" (on left), who’s Dad has been my friend since high school. Justin told me to set up in the stand I harvested this deer from and am I glad I did.